Thornton, February 10th 2019 peacefully at Orchard Lodge Care Home, Armagh. William John, beloved husband of the late Sylvia, devoted father of John, Paul and Yvette and a much loved grandfather and great-grandfather. Funeral Service in St Marks Parish Church, Portadown on Tuesday at 2pm followed by interment in Seagoe Cemetery. 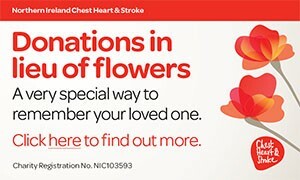 No flowers please, donations if desired payable to Alzheimer’s Society c/o Carole Murray, Edenderry House, 18 Gilford Road, Portadown, BT63 5ED. I am sorry to tell you that William John Thornton has passed away.